The International Distance Race is officially SOLD OUT! Congratulations to those participants who are registered for the race! The Classic Distance Race is still open but it will sell out soon so register today! Still want to take part in the action? The Nautica South Beach Triathlon Classic Distance is still available for you to register. This race features a 1/2 mile swim, 19 mile bike, and a 4 mile run. The Nautica South Beach Triathlon Classic distance race will feature a half-mile ocean swim, a 19-mile bike course, and a 4-mile out-and-back run course. The half-mile ocean swim in the beautiful, warm water (expected water temperature is 78 degrees) will run parallel to world famous South Beach. The 19-mile bike course will be a relatively flat course crossing over Miami Beach's famous Causeways with scenic views of the Intracoastal Waterway, downtown Miami and Miami Beach. The K-Swiss Run Course will be a very fast out and back course, alongside Miami Beach's Art Deco District, finishing on the white sands of South Beach. The Nautica South Beach Triathlon International Distance Race (also known as the Olympic Distance) course features a 1.5K ocean swim, a 40K out-and-back bike course, and a 10K out-and-back run course. The course will feature a beautiful, warm (expected water temperature is 78 degrees) ocean swim that will run parallel to world famous South Beach. The bike course will be a relatively flat course crossing over Miami Beach's famous Causeways with scenic views of the Intracoastal Waterway, downtown Miami and Miami Beach. The K-Swiss Run Course will be an out and back course, alongside Miami Beach's Art Deco District, finishing on the white sands of South Beach. 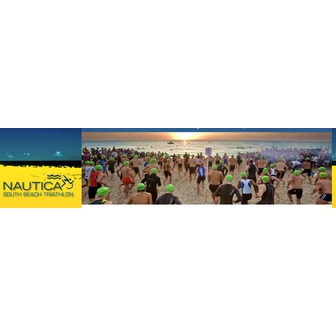 The Nautica South Beach Triathlon event will take place on Sunday, April 1, 2012 in Miami Beach, Florida, and a portion of the proceeds will benefit St. Jude Children's Research Hospital. The Nautica South Beach Triathlon course is specifically designed to showcase the best aspects of stunning Miami and Miami Beach and is easily becoming one of the most popular destination events! In fact, 40% of athletes in the 2011 race resided outside the state of Florida and hosted athletes and spectators from 44 states and 17 countries! While in South Beach, take advantage of the arts & culture, dining & hotels, shopping, nightlife, and recreation! The historic Art Deco cityscape is the groundwork for artistic inspiration and has been for the better part of the 20th century. The city offers year-round programs, exhibits, and collections from local and traveling artists featuring contemporary and classic pieces. There is no shortage of striking views of turquoise water and white sand from the beach side hotels and sidewalk cafes lining Ocean Drive. International cuisine is fused with spicy traditional Latin flavors to create the unique and appetizing menu that Miami Beach is known for. Independent boutiques with unique flavor coexist with the world's most well-known and influential designers along long-stretching boulevards like Ocean Drive, Collins Avenue, and Lincoln Road. Colorful, flowing pieces and, of course, bathing suits are a staple in Miami Beach attire. Warm nights beckon the tireless traveler to roof-top lounges, plush hotels, and lavish nightclubs where there is sure to be plenty of martinis! It is not uncommon to see partygoers' leaving the festivities after dawn breaks. Seven-miles of picturesque beach is the perfect destination for beach volleyball, snorkeling, jet-skiing, and of course sun bathing. The warm waters welcome even the most timid swimmers.